Online shopping is currently booming in India. Clothes, grocery, toys, electronic equipments, mobiles, tickets, etc can be bought online through various websites like Flipkart, Myntra, foodpanda, etc. Shopping online has several benefits, you can choose from a large variety, save time and travel expenses and go about shopping at the comfort of your home. I had heard about Cashkaro and its various coupons and cash back offers but had never tried it. When I got a mail from Swati, CEO and co founder of Cashkaro to review their website, I was inspired to try it. The method of joining cashkaro is simple and easy. You just have to sign up with your name, email address and password and you are done. You can check out coupons and cash back offers from more than 350 sites like Fabfurnish, Amazon, Naaptol, Homeshop18, etc that cashkaro partners with and select the offers you are interested in. Once you have decided what you want to buy, click on the link and copy the code. 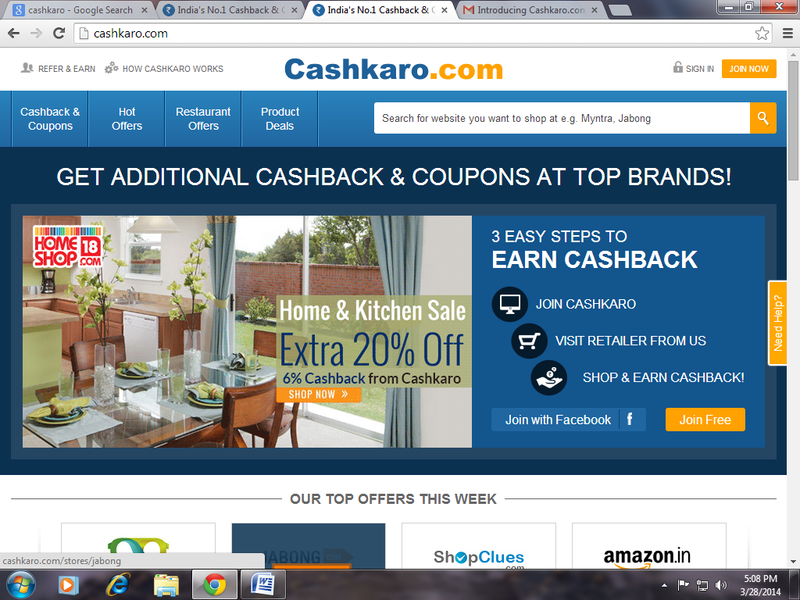 You will be redirected to the website automatically from cashkaro, where you can browse and shop as you always do. While paying for the order, use the code to avail the discount and pay as usual with your credit or debit card. You will get the discount right away while the cash back will be credited to your cashkaro account in 48 hours. This way cashkaro website helps you in saving money when you buy products online through cashkaro. Buying products through cashkaro is a great option for all those people who usually generally buy products online as by the end of the month you would have accumulated hundreds of rupees in cashback which can easily be sent to your bank account through cheque or NEFT. For all food lovers, Cashkaro also offers up to 45% off restaurant offers at popular restaurants like Stikers, Dominos and many more in Delhi, NCR and Mumbai. What more, if you refer a friend you will get 10% of the cashback your friend earns forever. So it is a great lifetime earning program. This was my first experience of using the cashkaro website and I must tell, I am mighty impressed with its various offers and cashbacks. The look of the website is great and it is very easy, even for a beginner to browse through. I checked out the deals from various websites and finally selected the First cry website as I wanted to buy toys for my little baby. I was asked to copy the coupon code and redirected to Firstcry .com instantly. Firstcry.com is Asia’s largest online baby and kids store and has everything you need for your baby. 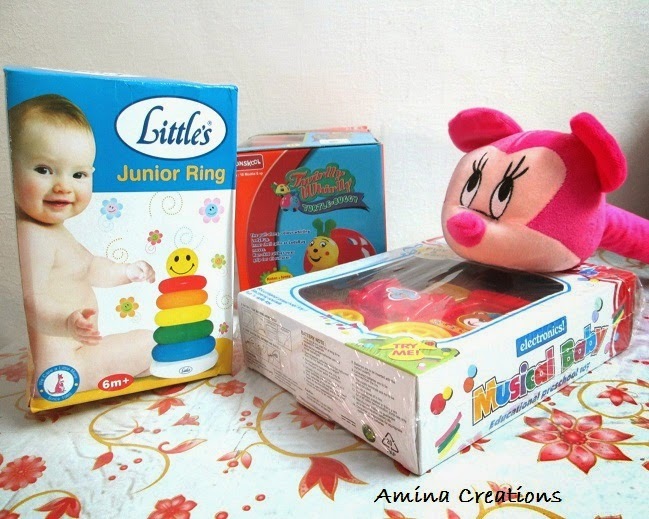 There was a large variety of toys on offer on first cry website and I had difficulty in selecting from the various choices of toys that I had. Finally I selected these four toys and finished shopping. While checking out I pasted the code that I had copied from cashkaro and got the discount instantly. The deal that I selected from cashkaro site had 15% discount and cashback up to 165 rupees on toys and gaming above Rs. 750 from first cry website. The goods were delivered within 2 days and were perfectly packaged and in good shape. In total I am very happy with my shopping experience with Cashkaro as also with First cry and would surely recommend this to others as well.